Woolworths launched an in store campaign based around collectable animal cards. Customers received a set of 4 random cards with their purchase and the aim was to collect each individual card to complete the collectables book. 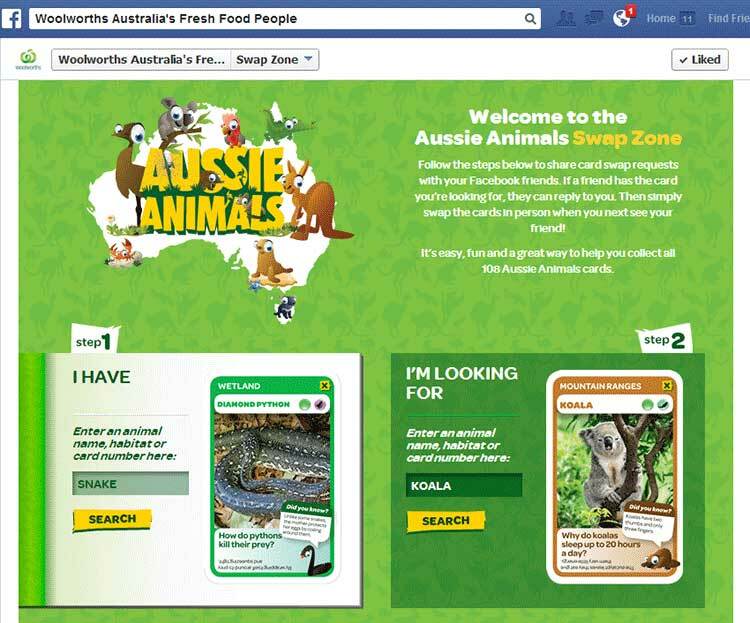 To support this campaign Woolworths made the decision to launch Facebook and mobile campaign sites to enable participants to let their friends know via Facebook which cards they had and which ones they were still looking for. Droga5 was tasked will bringing these sites to life for Woolworths and in turn brought Interesting in to handle the development. Given the bespoke nature of the campaign and the variety of platforms and browsers being targeted the front end sites and administration section for managing cards were custom built to fit the requirements. The site was successfully launched in September 2013.